Special Limited time Amazon Launch! Get both the R.E.M Spring® hair remover + the Hair-Nix® 2-in-1 Natural Skin Soothing Gel - and say goodbye to that pesky facial hair. 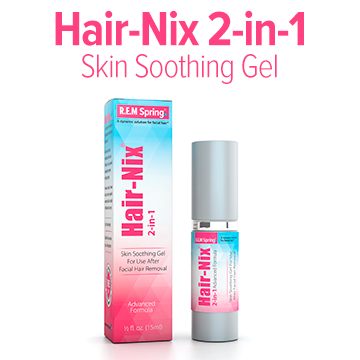 For best results use the Hair-Nix® twice daily and after each R.E.M Spring use. R.E.M Spring® is a do-it-yourself facial hair removal system designed for women to use on the upper and lower lips, chin, cheeks and neck areas. 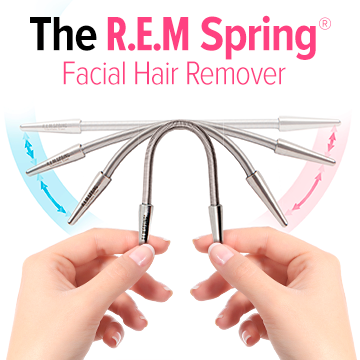 R.E.M Spring® is a device for removing facial hair from the root. Bend the R.E.M Spring® into an inverted U shape and place it against the area of skin where facial hair is to be removed. 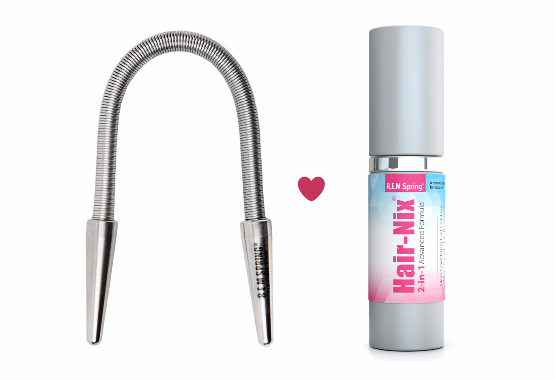 For best results use the Hair-Nix® botanical facial hair growth inhibitor after each use. Get the R.E.M Spring Bundle 50% OFF! Works fast to remove facial hair from the root. 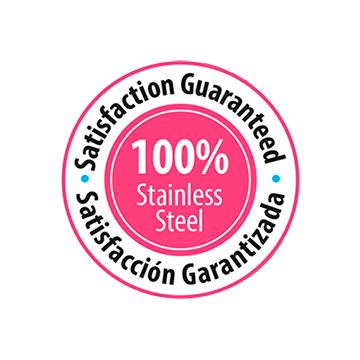 Made of 100% Professional Steel. Portable. Affordable. Built to last. 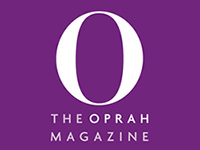 As seen on O Magazine. With Aloe-Vera Gel and Vitamin E.
Soothes & Heals the skin after facial hair removal. TIME LIMITED 50% OFF AMAZON LAUNCH EVENT. Pleasantly surprised! I am shocked by how well this works. I wasn't really expecting much, but it takes off hair easily and quickly with little irritation, and that goes away after you've used it a few times. I haven't waxed in months and I could not be happier. 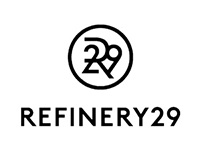 This is exactly what I was looking for and it works even better than the one I had used for many years before the airlines confiscated it from my cosmetics bag on a recent flight. I can't imagine what harm they thought I could do with it, but they had never seen it before and so it must have been dangerous. In any event, I look forward to many more years of useful service from my new one. Oh thank God I don't have to spend money on threading anymore. This is the greatest thing ever invented. Definitely twirl it with your right hand going clockwise and your left going counterclockwise to make it work. I AM BLOWN AWAY BY HOW AMAZING THIS PRODUCT WORKS! I am a makeup artist and hate having facial hair so when I first came across this I didn’t think this would actually be something to remove hair... well I was wrong. I have been waxing for years and I have the most sensitive skin. I would break out and be red for days. I am officially done waxing!! This doesn't hurt it, I think tweezing hurts more than this tool. This product pulls the hairs out by the root and leaves your skin so smooth and gets the hairs removed where you don’t want them. It’s very easy to hold and use. Also, you can’t beat the price. I use this on my entire face and I am so happy with the results!